This is an article sure to stir the pot…a bunch. Why? Because gun-lovers all have their personal preference and are usually passionate about expressing the opinion. Not me. Well, I am a gun-lover but I look at guns as tools to use to accomplish a certain task. Other than that, they are just another prep item to me. OK, they are incredibly enjoyable to shoot with friends and family but that is another whole story. For now, we will stick to what is the right carbine for a prepper. Most everyone can recognize a rifle, not hard to do. They are generally bolt action, lever action or semi-auto. But some people will have a harder time recognizing a carbine without wanting to call it a rifle. But the primary difference is a carbine has a shorter barrel. The shorter barrel made it easier for mounted cavalry to have most of the benefits of a rifle but without awkwardness of a long-barreled rifle. However, the shorter barrel did tend to reduce the distance that a soldier could shoot accurately. But mounted cavalry tended to engage the enemy at shorter distances so the shorter barrel wasn’t really much of an issue. In today’s day and age the modern soldiers generally like a shorter barreled weapon because it is more maneuverable and weighs less than the long-barreled alternatives. As this article progresses you will see those factors will come into play here as well. 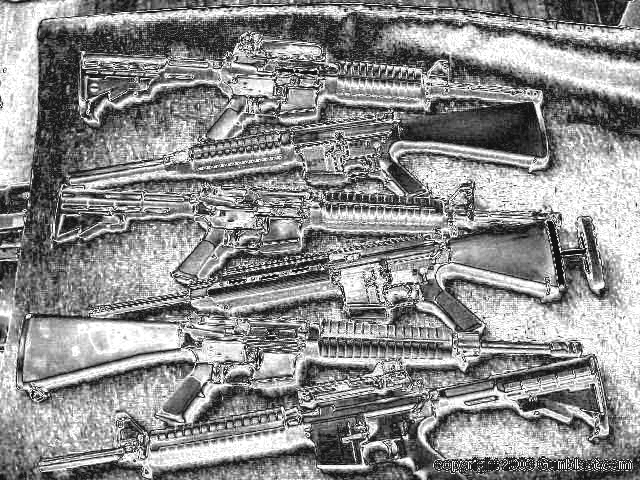 Let me back up a little so you can get the full appreciation of where I am coming from when it comes to rifles/carbines and the foundation of this article. While most kids in the 60’s & 70’s were having fun in high school I was shining shoes, polishing brass, marching and learning to love my Springfield 03-A3 rifle. I absolutely loved that rifle and could strip it, clean it, and reassemble it with my eyes closed with my 17-year old company commander yelling at me. But that rifle was a boat anchor, it weighed in at almost nine pounds. Doing calisthenics with it was even more fun…yeah, right. 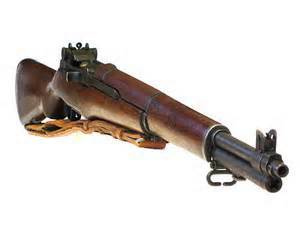 When I joined the US Navy right after high school (age 17) I was introduced to the M1 Garand. Wow! Another beautiful piece of weaponry. But it was even heavier and more cumbersome to use than the 03-A3. 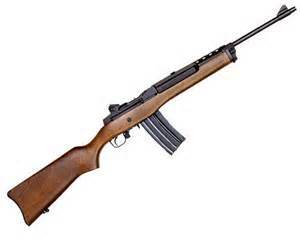 Then once I left the military and I got out on my own, becoming somewhat of an adult, I gravitated to the Ruger Mini-14. I am not sure why anymore, it was a long time ago. But I gotta tell you, the Mini-14 is a great carbine! That thing would shoot any kind of ammo and at one point I went years without cleaning it. Then I took it out of the closet dirty from using it a couple years earlier and it ran fine. About 10 years ago when I started to get more concerned with the direction of this country I decided it was time to “arm up” again. So naturally I went back to the reliable stand-by MIni-14 carbine that I knew well. I acquired one, then two. I bought some extra magazines and ammo. But as I looked at the Min-14 more and more as a tactical weapon that I might have to trust my family’s life with, I started to feel uneasy. The mags were not consistent quality unless they were original Ruger magazines. My buddies had AR’s. Our mags were not “swappable” in a pinch. I finally broke down and bough an AR, but it was an AR-10. I didn’t have a .308 weapon at the time and decided that was the best choice at the time. Whoa, was I wrong! So I went down to my local gun shop that I had been working with for years, the owner was a friend of mine. Notice the use of “was” in that sentence. I explained to him what I wanted as far as “mission” and asked for his advice. Little did I know that gun shop owners are there to sell guns. I thought he was there to be my friend, my confidant, and help through the process. I was wrong. I walked out of the store that day a proud owner of a DPMS AR-10 Sportical. Boy, did I get screwed! That DPMS went back to his gunsmith four times and back to DPMS twice. It was an utter piece of crap. I was assured it was a fluke and that DPMS was a good brand, I ended up with a different Sportical as a result. Same piece of crap, same problems, and a weapon that I would never, ever trust. 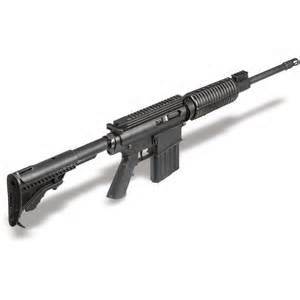 So my opinion of DPMS rifles…they are pure junk! So I decided that I would go with an AR-15 platform but was not thrilled with the stuff I was hearing about keeping them clean. The sand here in the SW is tough on them, and the AR had the reputation that they weren’t the most reliable weapon out there. OK, so I believed it and bought a Sig 5.56 Patrol carbine. It is a fantastic carbine, I love it! But I was burnt before on a gun from this guy so I was not going to trust him on his word. I headed out to the field straight from the gun shop with the carbine still in the box. I had 6 different brands of .223 & 5.56 ammo with me. Some high-end stuff and most of it cheap junk, including poly coated Russian ammo. I was going to see just what this thing could do, and see if it would live up to the Sig sterling reputation. I was so determined to push it to its limits that I didn’t even clean the rifle first, just started shooting it right out of the box. I wanted to make it FTF or FTE, jam, stove-pipe, anything. I just wanted to see this thing give up and stop running. 600 rounds later I was out of ammo and running out of daylight, I gave up. I didn’t experience a single problem of any kind with that Sig, it just kept eating up the ammo and spitting out the bullets. And it was amazingly accurate. I was hitting 4” plates at 300 yards with iron sites. Good enough for me. Since then I cleaned it a time or two, added a rail under the fore-guard for a light or vertical grip if I want to add one later. I also put a very nice 2-point Condor bungee sling on it. Yes, mulicam. Duh. And I had a buddy of mine Duracoat it in a great desert cammo paint job. It uses standard AR-15 magazines. It is piston driven so there isn’t a bunch of gas being driven into the gun’s upper. The stock folds back onto the upper to make a very compact carbine capable, very low profile. The bolt carrier group rarely needs disassembled for cleaning, mostly just wipe it down. The rest of the weapon is easy to clean as well. If the gun starts running dirty and you start to experience FTF or FTE issues you can adjust the gas level running the piston with a simple 1/4-turn. That adjustment will assist in correcting the FTE/FTF issues by forcing more gas against the piston that runs the bolt carrier group. There is a plastic “boot” that covers where the stock goes into the hinge. It is there to make it look pretty. The plastic retainer clips broke fairly early on and I ended up doing a Gorilla Glue fix on it. I had to add a small screw later as well to ensure that it would stay in place. It was no big deal but on a rifle that price, it should have never been an issue. The gas port exhausts right by the forward sling attachment point. Not that big a deal at all but it is a little annoying. Empty, with sling and optic, it weighs just under 10 pounds. That is fairly heavy for a carbine, especially if you might have to carry for days at a time while walking. And one slight modification that I made was removing the “bird cage” flash suppressor and replacing it with a Yankee Hill Phantom 5.56mm Comp/Flash Hider. I like the improved performance of the Phantom, and I like the aggressive edges if I have to use the muzzle as a “poking” device. Why do I keep the Sig around? Because it eats any ammo that I can feed it and it never, ever fails to go “bang” when the trigger is pulled. But I am not done with the “carbine saga” by any stretch of the imagination. I got a little tired of the weight and decided it was time to move 100% to the AR platform. We had adopted the AR as the “standard” in our little shooter group. Remember how badly burnt I was with the DPMS? Well, I had stopped frequenting the particular gun shop by then and was at a little bit of a loss on where to buy an AR, and also to trust what I was getting. About that time a buddy of mine told me he was selling his Designated Marksman Rifle (DMR). He builds really high-end rifles and I trusted him from other interactions I had with him. I talked to him for a couple of days and ended up owning his custom-built DMR. Oh, my, gosh! That thing is unreal sweet! He was telling me that he could shoot 600 yards with it all day long, even a cold barrel shot. He was right. But I am not a long distance shooter. I am more of a medium-distance and CQB kinda of guy. So I swapped the long distance scope for an ACOG. I very, very nice set-up. But it was still a little heavy and had a long-ish barrel. I wanted something for CQB and very light. Well, being the guy that I am I also decided that I needed to get more involved and familiar with the AR platform. You know, being able to fix one, or at least swap parts, if it broke down. So I got the brainy idea to build my own AR. Yea! It took me some time to meet the mission requirements, but I was able to do it. I did find that any reasonably decent lower would work. I am not talking the lower parts, just the lower blank. I bought one that carries a good reputation but I don’t think it was totally necessary to worry that much about the highest quality lower, I just happened onto the deal. When it came time for the upper I decided it had to be a Bravo Company upper. They have a top notch reputation overall, but especially in the Special Ops world. My choice was a BCM BFH 14.5″ Mid Length Upper Receiver Group with a 1.5 Battle Comp permanently installed. That made me legal by 1/4 of an inch on the barrel length. I didn’t want to build my upper because there are some precise measurements that are necessary for professional grade operations. I didn’t think I had the skills to do that. I added the Spike’s ST-T2 Heavy Buffer with their Mil-Spec 17-7 Buffer Spring. 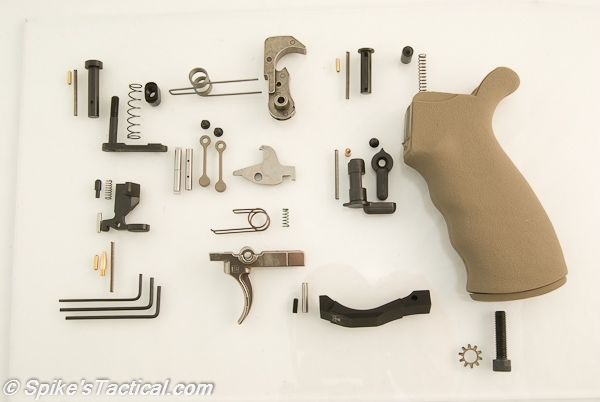 That all went inside of a Magpul MOE Collapsible Synthetic Carbine AR-15 Stock in flat dark earth color. To give myself a 2-point sling connection point I used a Daniel Defense EZ Carbine 2 Position Ambidextrous AR-15 Carbine Quick Detach Sling Swivel Attachment Point. For a sling I used a Blue Force Gear Vickers Combat Applications Sling. To finish off the lower I added the Original ERGO GRIP AT (aggressive texture). 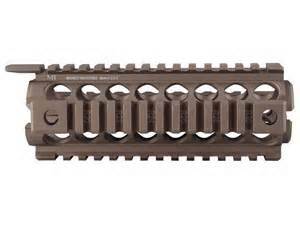 To complete the upper build I went with the Midwest Industries Gen2 Two-Piece Drop-in Mid-Length Tactical Handguard. To attach the sling to the fore-stock I used a quick-connect swivel that connects directly to the MI handguard. For the bolt-carrier group I used a BCM Bolt Carrier Group (MPI) – Auto coupled with a BCM AR15 Bolt Assembly (MPI). Then I topped it off with a BCM GUNFIGHTER Charging Handle (5.56mm/.223) w/ Mod 3 (LARGE) Latch. 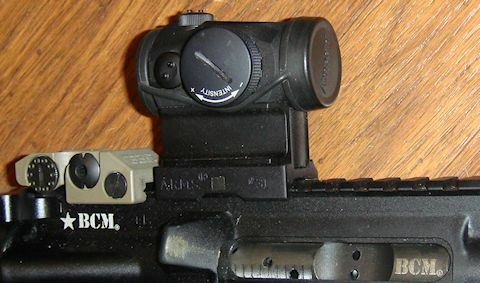 For optics I chose the Aimpoint Micro T-1 as my primary red dot optic. For back-up iron sights I went with the Troy Dioptic Tritium Folding Sight in flat dark earth. From start to finish it took me about 4 – 5 hours to put it all together. But when I was done I really knew how the rifle functioned and why. I also could clearly see the difference quality parts make. My buddy has an AR, a budget model. When you rack his weapon you can feel the grit and a “cheap” feel to it. When you rack my AR you know you are holding a high-quality weapon. For this article I don’t want to go into why I chose each piece that I listed above. But I will do another article later that covers the “build,” each piece and the thought process that went into each item. Some of you may really enjoy it, others…not so much, so I will leave it out of this article. The point I was trying to make is this; when I was done building the AR, the thing is incredibly reliable, unreal accurate and can take hard field use without any stress on it at all. And all for under nine pounds empty with everything I listed above. I had originally bought into the hype about keeping an AR spotless to ensure that it would be there for you and run when your life depended on it. Well, I believed that till I saw a video with an old Marine sergeant that is pretty crusty, and an award winning shooter. He talked about the main thing is to keep the bolt carrier group “wet” with a high-quality lubricant such as Slip 2000 EWL (Extreme Weapons Lubricant). He also talked about cleaning the bore with a bore snake as well, but only using the Slip 2000 without bore cleaner. So I put his idea to the test. I ran my weapon four times in the field and at the range without the “normal” way of cleaning it. But I kept it “wet” as he said. I was particularly worried about the sandy conditions here in the southwest. Well, the gun ran fine, no FTE or FTF issues. Now, I have since cleaned it and I do regularly clean it. But I learned a valuable lesson and realize that I shouldn’t believe hype, go to those that know. So I spent literally months researching AR-10 manufacturers, models, reputations, reviews, and everything I could get my hands on. 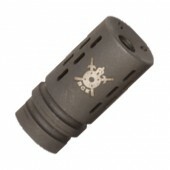 And only one manufacturer kept coming to the surface consistently… POF (Patriot Ordnance Factory) in Arizona. They had the best reviews hands down, period. A whole host of SpecOps folks and other operators raved about them. 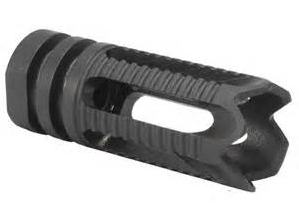 So I initially made the decision that I would purchase a POF P308 16.5” with the nickel-boron bolt carrier group. 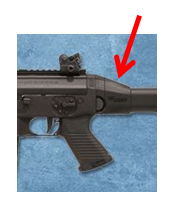 The P308 is a piston system vs. a gas impingement system. WOW!!!! Is about all I can say. But I still had to add a few things. I put on a Blue Force Gear Vickers Combat Applications 2-Point Sling with detachable swivels. Then I added a Trijicon ACOG 4×32 TA01B Scope with .308 Full Line Red Illumination and BDC. For back-up iron sights I went with a Troy Industries 3EZ11 folding front battle sight. For the rear I went with a Sig Sauer Rear Diopter Sight. All told…it comes in at slightly over 12 pounds. And it is worth every single ounce! Sig Sauer 5.56 Patrol Rifle. 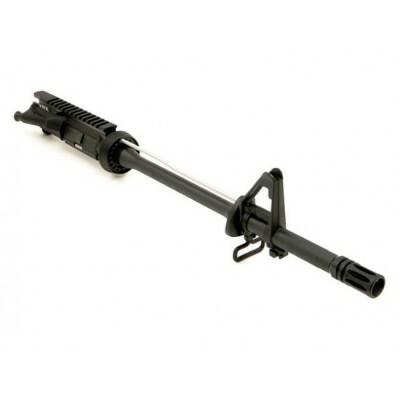 High-quality custom-Made AR-15 (BCM upper).